We all sweat. It’s a normal and necessary body function. But, there are many people who sweat excessively. To the point where it interferes with daily activities and can be uncomfortable, embarrassing, anxiety-inducing, dangerous and disabling. This kind of sweating is called Hyperhidrosis and you might be surprised to know that it affects nearly 5% of the world’s population. The good news is that Hyperhidrois is treatable and there are many different options for those who suffer with it. 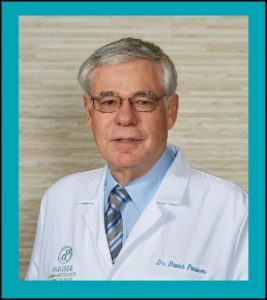 Pariser Dermatology’s Dr. David Pariser is a world-renowned expert on sweat reductions and a founder of the International Hyperhidrosis Society. Join us on Wednesday, March 28, 2018 at 6 pm at our Newport News office for a presentation by Dr. Pariser and learn the latest research and most effective treatment advice for excessive sweating. Join the movement to end hyperhidrosis. Don’t suffer in silence. We are here. And we are changing everything. According to dermatologists with the International Hyperhidrosis Society, the school years, from elementary through high school and college, are obviously formative and an important time in young people’s development of self-concept. Helping them to thrive includes the appropriate management of impactful health conditions like excessive sweating. For students, hyperhidrosis can be devastating. Dramatic sweating in the presence of peers at school, or in extracurricular or social environments, can cause severe embarrassment, stress, anxiety, and other emotional issues. Even when students are alone, away from potential judgements, hyperhidrosis often takes a heavy toll—adversely impacting a student’s productivity in a myriad of ways. Myth: Sweaty people are out-of-shape, nervous, or have hygiene issues. Truth: The average person has 2 to 4 million sweat glands. Sweat is essential to human survival and serves as the body’s coolant, protecting it from overheating. Many athletes actually sweat more than other people because their bodies have become very efficient at keeping cool. Meanwhile, people with hyperhidrosis (which is believed to cause overactive sweat glands) sweat excessively regardless of mood, weather, or activity level—often producing 4 or 5 times more sweat than is considered “normal”. Myth: Kids with hyperhidrosis don’t suffer with school-specific activities. Truth: In a recent 2017 study, 63% of those with hyperhidrosis reported interference in the performance of tasks at school or work due to their condition. Another study found that children and teens with hyperhidrosis can have difficulties manipulating writing utensils, keeping school work dry, gripping bicycle handlebars, and using a computer mouse. Myth: To have hyperhidrosis, one must be dripping and saturated with sweat. Truth: Excess sweating can range from severe dripping to moderate moisture. Symptoms of hyperhidrosis can manifest differently and personally. But, what is consistent is the impact on life. This can include damaged clothing, paperwork and shoes; obvious, embarrassing sweat marks on clothing; unappealing cold wet hands; discomfort due to dripping sweat or constant dampness; and skin slipperiness that gets in the way of sports, music, and day-to-day tasks. Excess sweating of the armpits, hands, feet, face, chest, back, or groin can result in substantial impairment, including limitations at work, in social and physical activities, and during hobbies. Emotional and psychological distress is also common. Myth: Kids will grow out of hyperhidrosis. Truth: Contrary to popular belief, research shows that hyperhidrosis does not go away or decrease with age. In fact, in one recent IHhS study, 88% of respondents said their excessive sweating had gotten worse or stayed the same over time. This was consistent across all the different age groups, from youngsters to older adults. Myth: Hyperhidrosis is “just” a summer thing, or it’s at least worse during the hot summer months. Truth: Research from the IHhS also shows that profuse sweating is not simply dictated by the time of year. The majority of patients in one survey indicated that their sweating bothers them equally, no matter the season. Myth: Kids and young adults are “resilient” and can deal with sweating a lot. Truth: Medical journal citations substantiate that young people are known to be significantly impacted by emotional sequelae accompanying dermatologic disease and that psychiatric issues inherently accompany dermatologic disease in children and adolescents. Studies further show that most patients with hyperhidrosis—characterized by excessive, spontaneous sweating beyond physiologic, thermal, or stress-reaction body requirements—describe their lives as “bad” or “very bad” due to the disorder. Myth: Antiperspirants are for underarms only. Truth: Think outside the pits! You can glide, stick, spray, and roll-on nearly anywhere that sweating is a problem (think hands, feet, face, back, chest, and even groin.) Be smart and talk to your dermatologist first before applying an antiperspirant to sensitive areas and test new products on small areas of skin first. Myth: Like caffeine, antiperspirants are best used in the morning. Truth: Pick a p.m. perk! Skip the bedtime espresso but do use your antiperspirant in the evening as well as in the morning. Sweat production is at its lowest at night, giving the active ingredients in antiperspirants a better chance to get into your pores and block perspiration when the sun comes up and you really get moving. Myth: Excessive sweating is less debilitating than other skin conditions people have to deal with. Truth: According to Dr. Pariser, former president of the American Academy of Dermatology, hyperhidrosis has the greatest impact of any dermatological disease. In fact, various investigations show the impact of hyperhidrosis on quality-of-life is equal or greater than that of in-patient psoriasis, severe acne, Darier disease, Hailey-Hailey disease, vitiligo, and chronic pruritus. Founded in 2003 by an elite team of world-respected physicians in hyperhidrosis research and treatment, the International Hyperhidrosis Society is the only independent, non-profit, global organization that strives to improve quality of life for those affected by excessive sweating. Its mission is to reduce the symptoms, anxiety, and social stigma associated with excessive sweating by improving the information, support, and treatment available to the millions of children, teens, and adults affected by hyperhidrosis worldwide. Certain Dri (Clarion Brands) and Dermira are proud supporters of the International Hyperhidrosis Society and its research, education, support, and advocacy efforts. Nobody likes to sweat, but perspiration is crucial in order to cool down the body when it is hot, stressed or after exercising. Consider it the body’s natural air conditioner as the evaporation of sweat on the skin causes cooling. We all sweat at times but some people sweat at times when they shouldn’t. Some people sweat constantly, even if they are not hot, stressed or after they’ve exercised. This is a medical condition called hyperhidrosis and it is more common than you might think. Over 4 million people in the US have this condition. Here at Pariser Dermatology we offer a full range of treatments for hyperhidrosis including Botox® injections and systemic therapy (in pill form). For a permanent solution to excessive underarm sweating, a procedure called miraDry® permanently destroys the underarm sweat glands with microwaves. If you suffer from hyperhidrosis, a consultation with one of our providers will help diagnose your condition and determine the most effective treatment for you. Often there is insurance coverage for these and other treatments. Even if you aren’t officially diagnosed with hyperhidrosis but you still want to sweat less, we can help. Treating your condition will save you money on laundry and dry cleaning to remove underarm stains. You won’t have to worry about having wet palms when shaking hands or suffer through sweat glistening on your forehead when you make a public presentation. Maybe you just want to improve your self-confidence. Discuss your issue with one of our providers. We will help you find a solution that works for you! Click here to learn more about miraDry.